If you have ever tried to shed a few pounds in the past, chances are you still remember how difficult it was. And as such it may come back to you that when you were trying; anything that could possibly help in speeding up that process would have been more than welcome. There is one often overlooked food (ok, I know it’s really a beverage) and it is coffee. It has been drunk for many years because of its effectiveness on weight loss over both the short and long term. Better yet, coffee is cheap, widely available and does not contain loads of other ingredients like some expensive designer weight loss supplements. Can coffee do the job for you? Well let’s continue on and find out! Can Coffee Promote Fat Loss? Did you know that there is a difference between fat burning and weight loss? Weight loss is basically a loose term that is used refer to weight of any kind being lost. This can be weight from any part of the body which includes water, fat and protein, some of which we don’t necessarily want to lose. On the other hand, fat loss as the name implies, refers to the losing of fat mass directly, and is what most of us really mean when we say we want to lose weight. Well the good news is that coffee is particularly efficient at doing this, thanks in a big part to the presence of caffeine. The way this is accomplished is due to increased expression of the hormone adrenalin, also known as epinephrine, which signals to fat cells to start freeing up the stored fat within the cells and make them available in blood. When it gets into the blood that fat is burned for fuel, so improving the release of fat can then speed up the fat loss. There are a number of things that can help or hinder your weight loss plans, but there is one big one that can throw a major spanner in the works, and that is your metabolic rate. In general the poorer your health is, the slower your metabolic rate is going to be, which in turn is going to slow down or even stop your weight loss progress altogether. Luckily for you, the caffeine found in coffee can give you a boost, and increase your metabolic rate even while you are resting. Yep, you read that right; you can burn more calories even while you are doing absolutely nothing. In a lean person, drinking coffee can increase their metabolic rate by as much as 29%, while in obese people it is around 10%. Regardless, 10% for obese people is still great, when taking into consideration no effort is involved and so is really a no brainer. 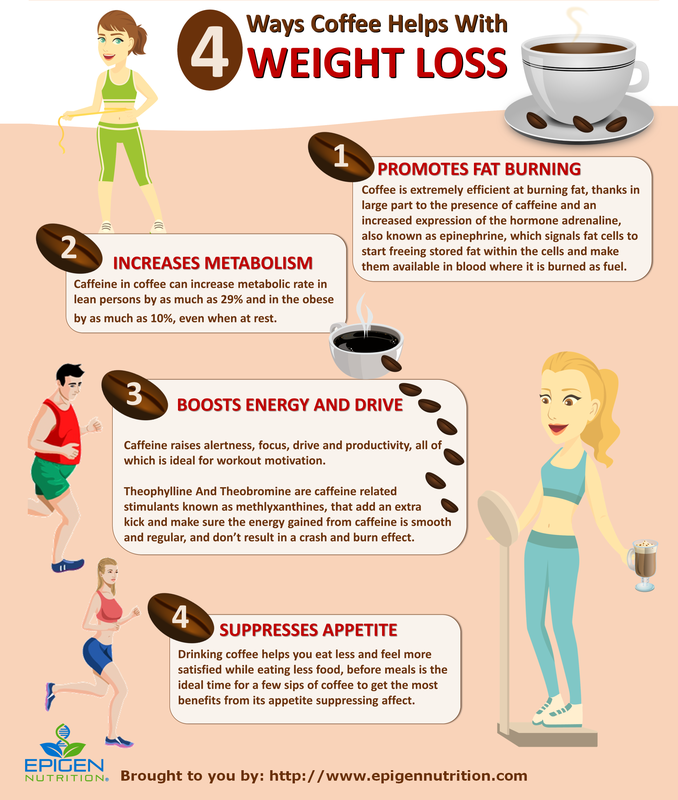 The only kind of downside to this benefit is the fact that the longer you use coffee/caffeine for weight loss, the less effective it becomes. This occurrence is known as tolerance, and a break is definitely advised after using caffeine or drinking multiple cups of coffee for several days in a row. 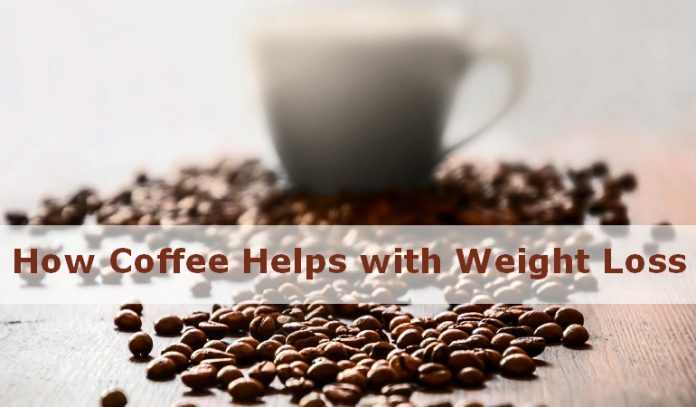 The benefits of this powerful beverage does not stop and being a weight loss wonder, coffee also contains a variety of stimulants that work to get the mind prepped and the body ready to increase physical output. • Caffeine- just about everyone’s favourite stimulant, caffeine raises alertness, combats sleepiness and can make the body produce more adrenaline. The result is increased focus, drive, and productivity. • Theophylline And Theobromine- also stimulants related to caffeine known as methlyxanthines, these add an extra kick, but also have the ability to ensure energy provided by caffeine is smooth and regular, and not in a big rise and crash fashion. This benefit regarding coffee is probably the most underused because of the different times when it is consumed. If you really want to get the best out of the appetite suppressing effects of coffee, it really needs to be taken before you eat. However what most of tend to do is, we consume it as a beverage after the meal. While this may help keep you full for a while longer, it would kind of make better sense (if weight loss was your goal) to have it before the meal, so you could reduce your calorie intake. Coffee is a versatile, yet underutilized tool in our quest for weight loss. One thing you need to remember is: you need to consume your coffee black in order to reap the best results, because cream and sugar adds useless calories and so defeats the object of the exercise.